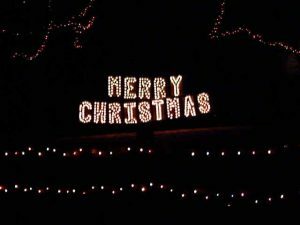 Our large Merry Christmas sign made it’s debut in Christmas 1999. However, the idea goes back to before Christmas 1998, and it wasn’t fully implemented until Christmas 2000. Here’s the story. During the Christmas season of 1998, the idea popped into Tim’s head to make a sign that spelled out Merry Christmas letter-by-letter. 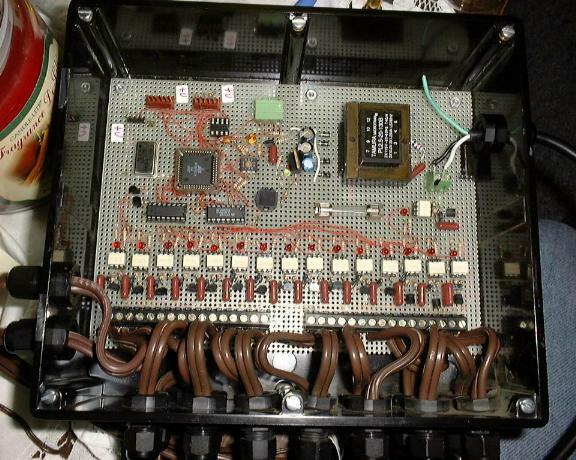 After searching around and finding that an appropriate lighting controller would be quite expensive to purchase, he approached his friend and former roommate Mike Bechtold, who was a “hardware guy”, and he started working on a design for a standalone computerized controller. After a long break during the summer months, they really started seriously working on it again in about October 1999, hoping to have it ready for Christmas. Meanwhile, Tim’s concept of the sign grew in proportions. He was originally thinking of a relatively small sign, but once we realized the potential of the controller, we expanded the concept. We decided to create a huge sign and hang it between the two trees that were approximately 40 feet apart. Each letter is on a plastic panel about 14 inches wide by 24 inches high. The panels themselves are spaced a couple of inches apart, so this makes for a big sign! Cathy and Tim drilled holes for each bulb through the plastic, and hot glued the bulbs down sideways so that the panels would be easier to store (very time consuming!). We used red and green garland to accent the letters, and strung them up on four nylon ropes. 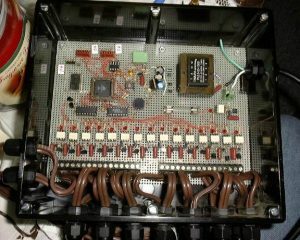 Inside the original “Merry Christmas” sign controller (retired after 2007): Fourteen of the brown wires controlled one letter of the sign. The two extra wires once controlled the trees which the sign hangs from. It made for quite the “octopus”! 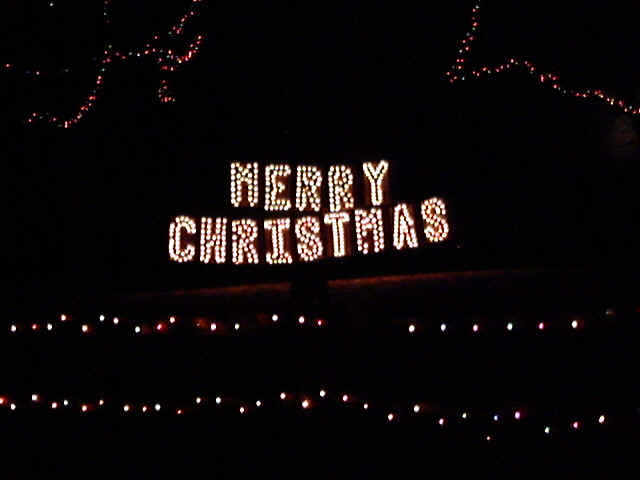 For Christmas 2001, we replaced the multicolor lights in the trees suspending the sign with solid-color lights. This made the entire display look more colorful and distinct from the rest of the displays in the yard, and started us down a new display aesthetic to use more solid-color lights in our displays. For Christmas 2002, the sign found a new home hung between two different trees at our new property. For 2004, we started controlling the two trees directly with Light-O-Rama. 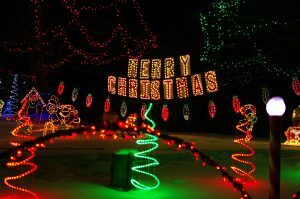 The Santa and snowman which flanked the Merry Christmas sign were now flashed the way the two trees used to, controlled by this dedicated controller. And in 2006, the sign was augmented by a string of 12 large mesh bulbs, all computer controlled. The Christmas 2007 season marked the last year that we used the original dedicated controller documented above. It served us well for nine seasons, but the fact that everything around the sign was synchronized to music, whereas the sign itself was not, was starting to become a liability. Also, the controller had a quirk that about once a season, the microcontroller decides to go bezerk, and we needed to hook a laptop up to it (not an easy prospect, once it’s deployed outside) and reprogram it. For 2008, we retired this controller and startedusing a standard LOR controller, like we use throughout the display, to control the sign. In addition to allowing us to synchronize the sign to the music, it gives us the ability to fade each letter individually, which allows for many new effects to be used on it. Here’s a view of the back of the Christmas sign in one of it’s early years. Inside a plastic bag behind the letter ‘T’ of Christmas is the controller. Wires go to from here to each of the letters, plus the two trees which the sign hangs from.